Gambling establishments were invented in the1950s in order to fish out people's assets with the help of hazard games that were played for centuries (blackjack, roulette, poker, slots and various lottery alternatives). Though predecessors of modern betting houses existed much earlier: starting from American saloons and similar public places in Europe. Referring to land casino history saloons hosted cowboys, gold seeker, fur traders, travellers and other residents of Wild West and other regions. Saloon owners supplied their clients with drinks, loud music entertainments and gambling games. First major gambling cities notable for hazard games and saloons were New Orleans, Chicago, San Francisco and St. Louis. But some time later in first part of the 20th century all gambling throughout the United States was prohibited and called illegal. However in 1931 gambling was legalized in Las Vegas City, Nevada. Thus first legalized casinos began to flourish in the heart of Nevada State. In 1978 gambling was legalized in Atlantic City, New Jersey. Now it is the second largest gambling place in the United States. Good Old Days in Vegas! The first recorded visit to valley took place in 1829 when Mexican scout Raphael Rivera decided to set his foot on the land of Las Vegas Springs. Originally the name to the city was given by Spaniards who were passing the American land and used to rest near Las Vegas Springs. Few decades later American military officer John Charles FrÃ©mont brought there a group of investigators. In 1855 American leader Brigham Young assigned thirty members of religious groups called missioners at that time to convert native residents of this area to Mormonism. Nevertheless in 1857 Mormons abandoned Las Vegas Valley. Until 1908 Sin City stopped being a part of Lincoln County and converted to newly created Clark County. Finally on March 16, 1911 Las Vegas became a separate city. Its first administrator's name was Peter Buol. Building of railroads has positive effect on the city. Thanks to Hoover Dam that is near Las Vegas it became to attract more tourists starting with the year of 1935. This led to expansion of hotel industry and other appropriate service areas. The legalization of hazard games and casino activity that took place in 1931 led to broad development of gambling industry. 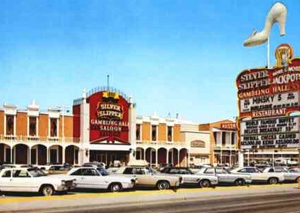 More casinos, hotels, resorts and other leisure places began to appear in Vegas. Modern Las Vegas is one of the largest gambling centers of the world. It lures gamblers from the very remote corners of the world. Las Vegas Strip is surrounded with casinos and other entertainments that will suit every taste and demands. All gambling roads lead to Las Vegas. It will leave not a single gamer indifferent. Welcome!